Earlier this week, the City of Nashua announced it will replace two diesel trolleys with new hybrid electric/diesel buses featuring technology from BAE Systems. Nashua is paying for the new vehicles through a $1.1 million Low or No Emission Grant from the U.S. Department of Transportation. But the city is not alone in its adoption of hybrid buses to move closer to zero-emission goals. Fifteen years ago, BAE System’s Endicott, N.Y. facility launched its hybrid propulsion systems. While early hybrid systems were clunky, using piping to power the accessories of a vehicle, BAE uses diesel only to power the generator, which in turn powers the battery that provides energy to the electric motor, not the engine, said Trichka. The system also collects the energy released from braking, to the point where it can regenerate the battery to full capacity. “The next generation really went to electrifying the accessories in the vehicle,” said Trichka, listing the power steering, air conditioning and air compressors as examples. By electrically powering these accessories, it increased the fuel economy by 30 percent and reduced some of the harmful emissions. The buses now have the electric range up to two-thirds the operating time of a typical bus. “Depending on the terrain, we can operate with the engine off and operate in zero emissions mode,” said Trichka. Why not just shift to an entirely electric bus? Besides concerns over charging infrastructure, there are other factors including the weight and size of the electric battery, which limits the capacity and also makes the bus more expensive, said Trichka. “We’re excited about a zero emissions future but it’s our firm belief it will take a while for the technology to mature and for the money for the infrastructure to accommodate that future, and in the meantime we can give you almost all of the benefits of a zero emissions vehicles without the infrastructure needs,” said Trichka. Adopting hybrid or electric technology has mainly been a “coastal phenomenon” in the U.S., he said. But interest may be growing in other less likely areas. 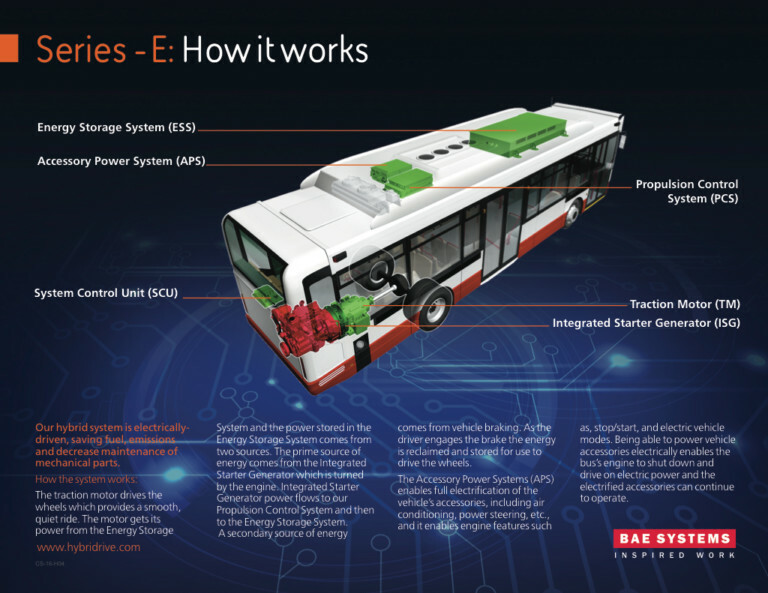 BAE will showcase their hybrid system technology at the American Public Transportation Association’s annual event, held next month in Nashville. “Were pretty excited, being in a place that hasn’t been a stronghold of hybrids,” he said, although noted that Houston was an early adopter of hybrid buses. Asked whether the Volkswagen settlement funds could provide a boost in hybrid buses in municipalities, Trichka said each state differed in their approach. “We’ve tracked that very closely. Interestingly the approach to using those funds varies widely from state to state. Some states want more efficient school buses, some are doing things with boats and ferries, so it’s all over the map. Yes, there’s a lot of money in that settlement fund, but as the percentage of money spent on passenger buses, it’s a small amount. It’s not something we see as transformative, but we have seen smaller buys in cities where they’ve bought buses with technology,” he said. BAE worked closely with the Nashua Transit System as they considered purchasing the buses. Setting aside emissions and energy efficiency, hybrid buses have other notable qualities.